This article is about the bramble fruit, not to be confused with the tree fruit Morus nigra or the black raspberry. For the brand, see BlackBerry. For other uses, see Blackberry (disambiguation). The blackberry is an edible fruit produced by many species in the genus Rubus in the family Rosaceae, hybrids among these species within the subgenus Rubus, and hybrids between the subgenera Rubus and Idaeobatus. The taxonomy of the blackberries has historically been confused because of hybridization and apomixis, so that species have often been grouped together and called species aggregates. 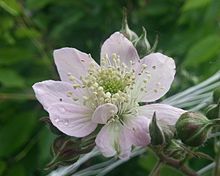 For example, the entire subgenus Rubus has been called the Rubus fruticosus aggregate, although the species R. fruticosus is considered a synonym of R. plicatus. What distinguishes the blackberry from its raspberry relatives is whether or not the torus (receptacle or stem) "picks with" (i.e., stays with) the fruit. When picking a blackberry fruit, the torus stays with the fruit. With a raspberry, the torus remains on the plant, leaving a hollow core in the raspberry fruit. The term bramble, a word meaning any impenetrable thicket, has traditionally been applied specifically to the blackberry or its products, though in the United States it applies to all members of the genus Rubus. In the western US, the term caneberry is used to refer to blackberries and raspberries as a group rather than the term bramble. In its first year, a new stem, the primocane, grows vigorously to its full length of 3–6 m (in some cases, up to 9 m), arching or trailing along the ground and bearing large palmately compound leaves with five or seven leaflets; it does not produce any flowers. In its second year, the cane becomes a floricane and the stem does not grow longer, but the lateral buds break to produce flowering laterals (which have smaller leaves with three or five leaflets). First- and second-year shoots usually have numerous short-curved, very sharp prickles that are often erroneously called thorns. These prickles can tear through denim with ease and make the plant very difficult to navigate around. Prickle-free cultivars have been developed. The University of Arkansas has developed primocane fruiting blackberries that grow and flower on first-year growth much as the primocane-fruiting (also called fall bearing or everbearing) red raspberries do. Blackberries grow wild throughout most of Europe. They are an important element in the ecology of many countries, and harvesting the berries is a popular pastime. However, the plants are also considered a weed, sending down roots from branches that touch the ground, and sending up suckers from the roots. In some parts of the world without native blackberries, such as in Australia, Chile, New Zealand, and the Pacific Northwest of North America, some blackberry species, particularly Rubus armeniacus (Himalayan blackberry) and Rubus laciniatus (evergreen blackberry), are naturalised and considered an invasive species and a serious weed. Blackberry fruits are red before they are ripe, leading to an old expression that "blackberries are red when they're green". As there is evidence from the Iron Age Haraldskær Woman that she consumed blackberries some 2,500 years ago, it is reasonable to conclude that blackberries have been eaten by humans over thousands of years. Cultivated blackberries are notable for their significant contents of dietary fiber, vitamin C, and vitamin K (table). A 100 gram serving of raw blackberries supplies 43 calories and 5 grams of dietary fiber or 25% of the recommended Daily Value (DV) (table). In 100 grams, vitamin C and vitamin K contents are 25% and 19% DV, respectively, while other essential nutrients are low in content (table). Blackberries contain both soluble and insoluble fiber components. Blackberries contain numerous large seeds that are not always preferred by consumers. The seeds contain oil rich in omega-3 (alpha-linolenic acid) and omega-6 (linoleic acid) fats as well as protein, dietary fiber, carotenoids, ellagitannins, and ellagic acid. Worldwide, Mexico is the leading producer of blackberries, with nearly the entire crop being produced for export into the off-season fresh markets in North America and Europe. The Mexican market is almost entirely from the cultivar 'Tupy' (often spelled 'Tupi', but the EMBRAPA program in Brazil from which it was released prefers the 'Tupy' spelling). In the US, Oregon is the leading commercial blackberry producer, producing 42.6 million pounds on 6,180 acres (25.0 km2) in 1995 and 40.25 million pounds on 6,300 acres (25 km2) in 2017. Semi-erect, prickle-free blackberries were first developed at the John Innes Centre in Norwich, UK, and subsequently by the USDA-ARS in Beltsville, Maryland. These are crown forming and very vigorous and need a trellis for support. Cultivars include 'Black Satin' 'Chester Thornless', 'Dirksen Thornless', 'Hull Thornless', 'Loch Maree', 'Loch Ness', 'Loch Tay', 'Merton Thornless', 'Smoothstem', and 'Triple Crown'. The cultivar 'Cacanska Bestrna' (also called 'Cacak Thornless') has been developed in Serbia and has been planted on many thousands of hectares there. In raspberries, these types are called primocane fruiting, fall fruiting, or everbearing. 'Prime-Jim' and 'Prime-Jan' were released in 2004 by the University of Arkansas and are the first cultivars of primocane fruiting blackberry. They grow much like the other erect cultivars described above; however, the canes that emerge in the spring will flower in mid-summer and fruit in late summer or fall. The fall crop has its highest quality when it ripens in cool mild climate such as in California or the Pacific Northwest. 'Illini Hardy', a semi-erect prickly cultivar introduced by the University of Illinois, is cane hardy in zone 5, where traditionally blackberry production has been problematic, since canes often failed to survive the winter. Blackberry production in Mexico has expanded enormously in the past decade.[when?] While once based on the cultivar 'Brazos', an old erect blackberry cultivar developed in Texas in 1959, the Mexican industry is now dominated by the Brazilian 'Tupy' released in the 1990s. 'Tupy' has the erect blackberry 'Comanche', and a "wild Uruguayan blackberry" as parents. Since there are no native blackberries in Uruguay, the suspicion is that the widely grown 'Boysenberry' is the male parent. In order to produce these blackberries in regions of Mexico where there is no winter chilling to stimulate flower bud development, chemical defoliation and application of growth regulators are used to bring the plants into bloom. Because blackberries belong to the same genus as raspberries, they share the same diseases, including anthracnose, which can cause the berry to have uneven ripening. Sap flow may also be slowed. They also share the same remedies, including the Bordeaux mixture, a combination of lime, water and copper(II) sulfate. The rows between blackberry plants must be free of weeds, blackberry suckers and grasses, which may lead to pests or diseases. Fruit growers are selective when planting blackberry bushes because wild blackberries may be infected, and gardeners are recommended to purchase only certified disease-free plants. The spotted-wing drosophila, Drosophila suzukii, is a serious pest of blackberries. Unlike its vinegar fly relatives, which are primarily attracted to rotting or fermented fruit, D. suzukii attacks fresh, ripe fruit by laying eggs under the soft skin. The larvae hatch and grow in the fruit, destroying the fruit's commercial value. Another pest is Amphorophora rubi, known as the blackberry aphid, which eats not just blackberries but raspberries as well. The loci controlling the primocane fruiting was mapped in the F Locus, on LG7, whereas thorns/hornlessness was mapped on LG4. Better understanding of the genetics is useful for genetic screening of cross-breds, and for genetic engineering purposes. Folklore in the United Kingdom tells that blackberries should not be picked after Old Michaelmas Day (11 October) as the devil (or a Púca) has made them unfit to eat by stepping, spitting or fouling on them. There is some value in this legend as autumn's wetter and cooler weather often allows the fruit to become infected by various molds such as Botryotinia which give the fruit an unpleasant look and may be toxic. According to some traditions, a blackberry's deep purple color represents Christ's blood and the crown of thorns was made of brambles, although other thorny plants, such as Crataegus (hawthorn) and Euphorbia milii (crown of thorns plant), have been proposed as the material for the crown. ^ Jarvis, C.E. (1992). "Seventy-Two Proposals for the Conservation of Types of Selected Linnaean Generic Names, the Report of Subcommittee 3C on the Lectotypification of Linnaean Generic Names". Taxon. 41 (3): 552–583. doi:10.2307/1222833. JSTOR 1222833. ^ Gina Fernandez; Elena Garcia; David Lockwood. "Fruit development". North Carolina State University, Cooperative Extension. Retrieved 9 August 2018. ^ Shorter Oxford English Dictionary (6th ed.). Oxford, UK: Oxford University Press. 2007. p. 3804. ISBN 978-0199206872. ^ a b c Huxley, Anthony. Dictionary of gardening. London New York: Macmillan Press Stockton Press. ISBN 978-0-333-47494-5. OCLC 25202760. ^ Blamey, Marjorie (1989). The illustrated flora of Britain and northern Europe. Hodder & Stoughton. ISBN 978-0-340-40170-5. OCLC 41355268. ^ David L. Green. "Blackberry Pollination Images". The Pollination Home Page. ^ Fedriani, JM, Delibes, M. 2009. "Functional diversity in fruit-frugivore interactions: a field experiment with Mediterranean mammals." Ecography 32: 983–992. ^ Palmatier, Robert Allen (30 August 2000). Food: A Dictionary of Literal and Nonliteral Terms. Santa Barbara, Calif.: Greenwood. p. 26. ISBN 9780313314360. Retrieved 17 March 2018. ^ a b c "Nutrition facts for raw blackberries". Nutritiondata.com. Conde Nast. 2012. ^ Jakobsdottir, G.; Blanco, N.; Xu, J.; Ahrné, S.; Molin, G. R.; Sterner, O.; Nyman, M. (2013). "Formation of Short-Chain Fatty Acids, Excretion of Anthocyanins, and Microbial Diversity in Rats Fed Blackcurrants, Blackberries, and Raspberries". Journal of Nutrition and Metabolism. 2013: 1–12. doi:10.1155/2013/202534. PMC 3707259. PMID 23864942. ^ Bushman BS, Phillips B, Isbell T, Ou B, Crane JM, Knapp SJ (December 2004). "Chemical composition of caneberry (Rubus spp.) seeds and oils and their antioxidant potential". Journal of Agricultural and Food Chemistry. 52 (26): 7982–7. doi:10.1021/jf049149a. PMID 15612785. ^ Sellappan, S.; Akoh, C. C.; Krewer, G. (2002). "Phenolic compounds and antioxidant capacity of Georgia-grown blueberries and blackberries". Journal of Agricultural and Food Chemistry. 50 (8): 2432–2438. doi:10.1021/jf011097r. PMID 11929309. ^ Halvorsen BL, Carlsen MH, Phillips KM, et al. (July 2006). "Content of redox-active compounds (ie, antioxidants) in foods consumed in the United States". The American Journal of Clinical Nutrition. 84 (1): 95–135. doi:10.1093/ajcn/84.1.95. PMID 16825686. ^ "Blackberry Production in Oregon". Northwest Berry & Grape Information Network. Retrieved 16 May 2015. ^ "Press Release June 27, 2018" (PDF). United States Department of Agriculture, National Agricultural Statistics Service, Northwest Regional Field Office. Retrieved 19 February 2019. ^ "Evergreen blackberry, Oregon Raspberry and Blackberry Commission". Oregon-Berries.com. Retrieved 13 June 2017. ^ "Marionberry, Oregon Raspberry and Blackberry Commission". Oregon-Berries.com. Retrieved 13 June 2017. ^ "Thornless Processing Blackberry Cultivars : USDA ARS". www.ARS.USDA.gov. Retrieved 13 June 2017. ^ Folta, Kevin M.; Kole, Chittaranjan (2011). Genetics, Genomics and Breeding of Berries. CRC Press. pp. 69–71. ISBN 978-1578087075. ^ a b Folta, Kevin M.; Kole, Chittaranjan (2011). Genetics, Genomics and Breeding of Berries. CRC Press. p. 71. ISBN 978-1578087075. ^ Fernandez, Gina; Ballington, James. "Growing blackberries in North Carolina". North Carolina Cooperative Extension Service, North Carolina University Press. p. 2. Retrieved 9 October 2015. ^ Vincent, Christopher I. (2008). Yield Dynamics of Primocane-fruiting Blackberries Under Hightunnels and Ambient Conditions, Including Plant Growth Unit Estimations and Arthropod Pest Considerations. ProQuest. p. 2. ISBN 978-0549964759. Retrieved 12 November 2012. ^ Clark, J.R.; Strick, B.C. ; Thompson, E.; Finn, C.E. (2012). "Progress and challenges in primocane-fruiting blackberry breeding and cultural management". Acta Horticulturae. 926: 387–392. ^ Bradley, Fern Marshall; Ellis, Barbara W.; Martin, Deborah L. (2010). The Organic Gardener's Handbook of Natural Pest and Disease Control: A Complete Guide to Maintaining a Healthy Garden and Yard the Earth-Friendly Way. Rodale, Inc. p. 51. ISBN 978-1605296777. Retrieved 12 November 2012. ^ "Growing Raspberries & Blackberries" (PDF). cals.uidaho.edu. p. 29. Retrieved 13 November 2012. ^ Controlling diseases of raspberries and blackberries. United States. Science and Education Administration. 1980. p. 5. Retrieved 12 November 2012. ^ Waite, Merton Benway (1906). Fungicides and their use in preventing diseases of fruits. U.S. Dept. of Agriculture. p. 243. Retrieved 12 November 2012. ^ "Bordeaux Mixture". ucdavis.edu. June 2010. Retrieved 13 November 2012. ^ a b Ensminger, Audrey H. (1994). Foods and Nutrition Encyclopedia: A-H. p. 215. ISBN 9780849389818. Retrieved 12 November 2012. ^ Shrock, Denny (2004). Home Gardener's Problem Solver: Symptoms and Solutions for More Than 1,500 Garden Pests and Plant Ailments. Meredith Books. p. 352. ISBN 978-0897215046. Retrieved 12 November 2012. ^ a b Doug Walsh. "Spotted Wing Drosophila Could Pose Threat For Washington Fruit Growers" (PDF). sanjuan.WSU.edu. Archived from the original (PDF) on 6 August 2010. Retrieved 12 November 2012. ^ Hill, Dennis S. (1987). Agricultural Insect Pests of Temperate Regions and Their Control. Cambridge University Press. p. 228. ISBN 978-0521240130. Retrieved 12 November 2012. ^ The Review of Applied Entomology: Agricultural, Volume 18. CAB International. 1931. p. 539. Retrieved 12 November 2012. ^ Squire, David (2007). The Garden Pest & Diseases Specialist: The Essential Guide to Identifying and Controlling Pests and Diseases of Ornamentals, Vegetables and Fruits. New Holland Publishers. p. 39. ISBN 978-1845374853. Retrieved 12 November 2012. ^ Castro, P.; Stafne, E. T.; Clark, J. R.; Lewers, K. S. (16 July 2013). "Genetic map of the primocane-fruiting and thornless traits of tetraploid blackberry". TAG. Theoretical and applied genetics. Theoretische und angewandte Genetik. Springer Nature. 126 (10): 2521–2532. doi:10.1007/s00122-013-2152-3. ISSN 0040-5752. PMID 23856741. ^ "Michaelmas Traditions". BlackCountryBugle.co.uk. 7 October 2010. Retrieved 13 June 2017. ^ "Michaelmas, 29th September, and the customs and traditions associated with Michaelmas Day". www.Historic-UK.com. Retrieved 13 June 2017. ^ Watts, D.C. (2007). Dictionary of Plant Lore (Rev. ed.). Oxford: Academic. p. 36. ISBN 978-0-12-374086-1. ^ Alexander, Courtney. "Berries As Symbols and in Folklore" (PDF). Cornell Fruit. Retrieved 11 August 2015. ^ Hawthorn. Encyclopædia Britannica: A Dictionary of Arts, Sciences, and General Literature, Volume 11; R.S. Peale. 1891. ^ Ombrello T (2015). "Crown of thorns". Union County College, Department of Biology, Cranford, NJ. Retrieved 18 August 2015. Allen, D. E.; Hackney, P. (2010). "Further fieldwork on the brambles (Rubus fruticosus L. agg.) of North-east Ireland". Irish Naturalists' Journal. 31: 18–22. Wikimedia Commons has media related to Blackberry. This page was last edited on 20 April 2019, at 03:24 (UTC).